Custom Wedding Bands - The perfect fit everytime! A Wedding Ring is the most precious item of jewellery anyone can own so the style and fit is of paramount importance. We pride ourselves on being able to create all styles of wedding rings but we Specialise in custom wedding bands. These custom wedding bands we design exclusively ourselves to fit around even the most complex of Engagement Rings. Our skilled master craftsman will take into account the most intricate details from your Engagement Ring to ensure your custom wedding bands are a perfect fit in every way. We take into account the width, depth, metal type, colour, stone type and size along with a whole lot more detail a lot of other manufacturers miss or overlook as it adds both time and complexity to the job. 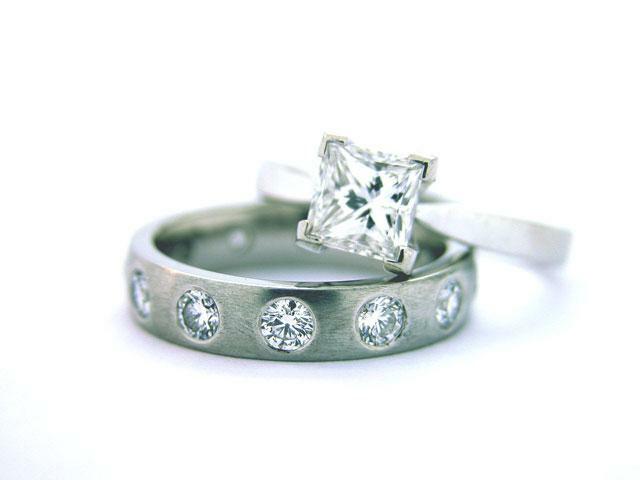 The purpose behind all this work is to create custom wedding bands that you not only fit but are beautiful to look at.